LRTimelapse is a comprehensive solution for editing, grading, keyframing and rendering time lapse videos on your Mac. The utility is using the Adobe Camera RAW engine and Lightroom to allow you to work directly on RAW files. To start working with the LRTimelapse application, simply use the built-in importer tool to add the RAW pictures from your time lapse photo shoot sessions. However, LRTimelapse also comes with an integrated file browser that allows you to navigate both your local storage and external drives. 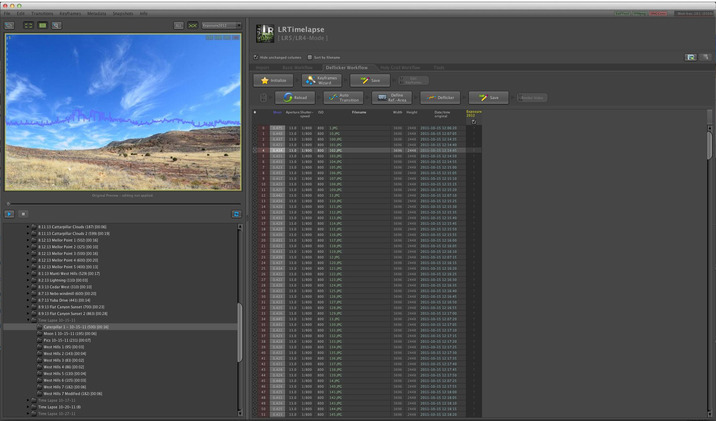 Within the LRTimelapse user interface, you can browse through the sequences and preview the captured images. Depending on the data you have available you must choose the workflow you want to apply to your sequence. LRTimelapse offers you the possibility to configure how many keyframes you want to use and then helps you export the data into the Lightroom application for further editing. After you process the keyframes within Lightroom, you can import the sequence back to LRTimelapse, add transition effects and preview the results. The best part is that LRTimelapse fully integrates with your Lightroom installation with the help of a plug-in, so sending data to and fro is as easy as pressing a button. Besides the Basic and DeFlicker time lapse workflows, LRTimelapse also integrates the Holy Grail configuration tool that can help you create seamless day to night transitions without making too many adjustments. Finding your way around is fairly intuitive, but to learn basic notions and to get tips and tricks on how you can efficiently use LRTimelapse, make sure to go online and watch the video tutorials provided by the developer. Added version check for Adobe DNG Converter. This makes it easier to keep it always updated in order to ensure support for the latest camera models. The White Balance information from the camera will now be preserved when bringing the sequence to Lightroom. You can then start editing with the White balance that the camera provided as default value on the keyframes. Auto Transition will then take over the values from the keyframes (either from camera or modified by the user) and set them to “Custom” in order to make the transitions. Fixed: When “Clear Metadata” was used (normally not something you’d need to do) a subsequent initialization of the metadata didn’t respect the “Set 16:9 crop when initializing” setting. Fixed: Under the same precondition like the last issue, the Keyframes Wizard was not activated after a reinitialization of the sequence. (Thanks to forum user Teemu76 for reporting these two issues). Fixed: On the very first start of LRT on a computer, the log file dialog was shown too small.